With the weather being so beautiful this week, we thought it only fair for some of our collections items to leave the dark, cool store rooms and enjoy some time in the (UV, temperature and humidity controlled) light. 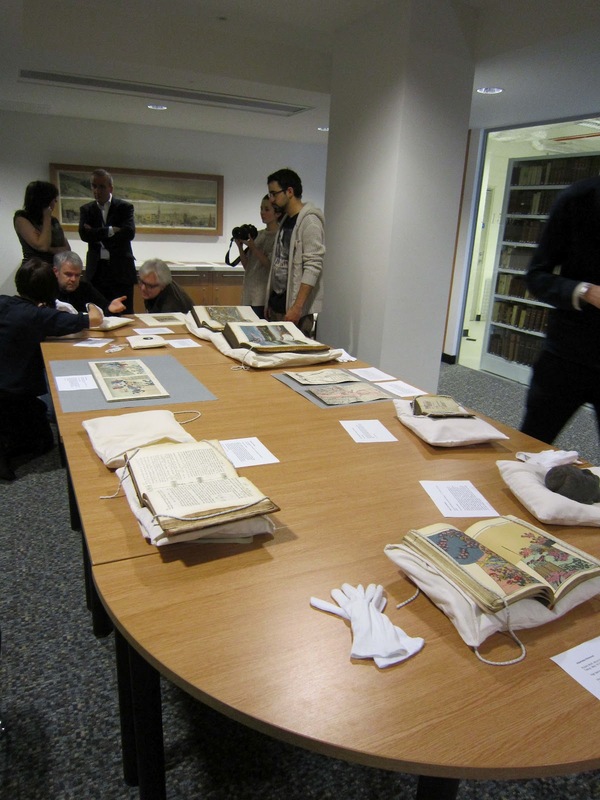 Along with the usual readers consulting items, we’ve had a visit from MSc students studying Medicine & Society in Modern Britain who were treated to a look at some of our great Rosslynlee Hospital records during their seminar. Not content with a mere afternoon away from the stores, some records will be out for considerably longer as they feature in two exhibitions opening this weekend. Two of our Andrew Kennedy drawings will sit alongside other masterpieces from University Collections in the second of this series of exhibitions. 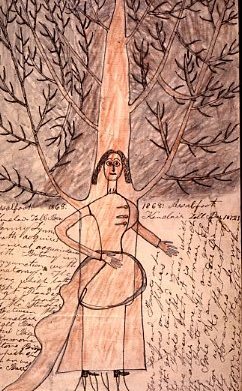 Andrew Kennedy (1825-1899) was a patient at various Scottish asylums during his lifetime, including the Royal Edinburgh Hospital whose Physician Superintendent collected 34 of his drawings. Masterpieces II, which runs from 31st March to 30th June in the Exhibition Room at Edinburgh University Library, features a varied selection including Alexander Fleming’s penicillin mould, a Picasso, 9th century fragments of the Qur’an and a 16th century violin. For more information, see www.ed.ac.uk. Finally, a selection of our nursing badges have gone on long-term loan as part of the Unsung Heroes exhibition at the Royal Infirmary of Edinburgh (Out Patient Department 3). They feature alongside artwork created by contemporary jewellers which was inspired by the badges, and oral history testimony collected as part of the project. 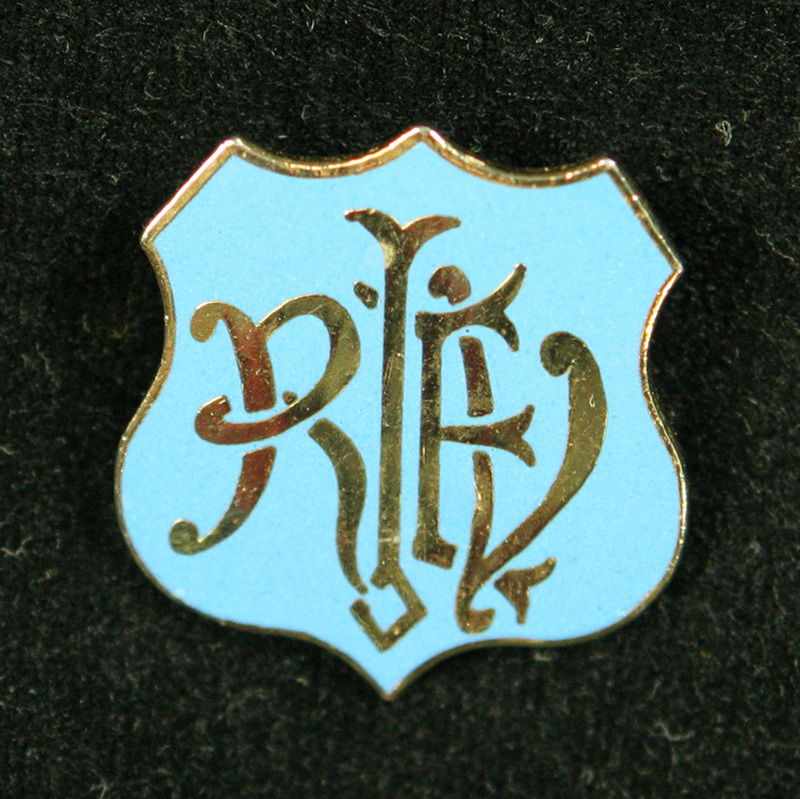 For more information see http://nursingbadges.wordpress.com/. LHSA’s case note collections are steadily being looked through to check they are in the correct order. During the ordering of the Alexander Miles collection, there have been several interesting finds, of which one is presented for this week’s blog. The Miles collection covers 1909-1924, 15 years being the statutory period for a doctor to be in charge of wards at the Royal Infirmary of Edinburgh (RIE). 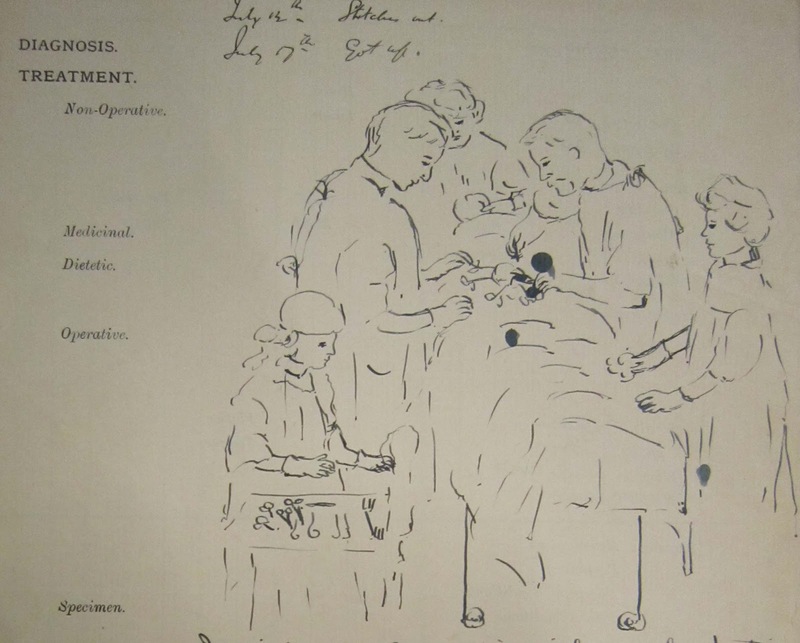 On the reverse of a case note dated 1910, was found a line drawing of an operation in progress. Alexander Miles (1865-1953) worked in wards 5 and 6 of the RIE at this time, carrying out general surgery. At a table in the foreground on the left, an assistant is ready to pass medical equipment across when it is needed. An interesting detail is that all of the staff are wearing gloves except for the man who appears to be carrying out the surgery. Harley Williams noted that Alexander Miles operated without gloves and with his sleeves rolled up, so it is possible that this is him. 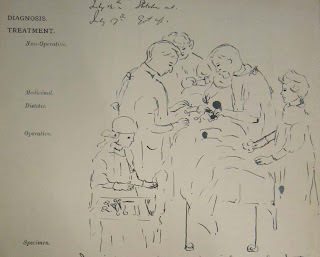 The drawing is not signed, but presumably it was drawn from life by someone watching the operation and who only had the patient’s case note to write on! Two drawings from LHSA’s collection of patient art by Andrew Kennedy (1825-1899) will be going on display shortly as part of Edinburgh University’s exhibition ‘Masterpieces II’. The exhibition opens in April and preparations are well underway. The items that will be included were chosen a few months ago, and finishing touches have just been made to the captions and the graphics for the back of each display case. Yesterday, a selection of the items that will be exhibited, including the Kennedy drawings, were laid out in our viewing room for a press call. 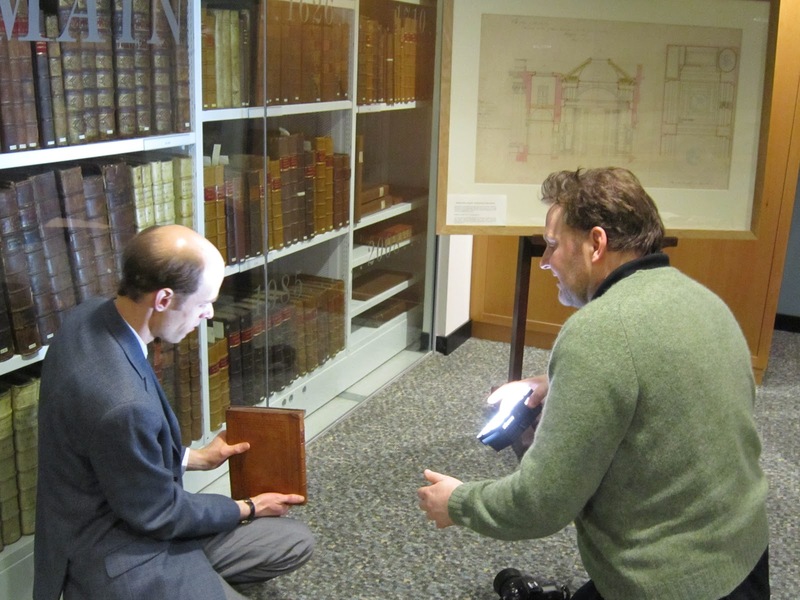 Photographers from a number of papers and press agencies were given the opportunity to take images for publicity purposes, including some posed shots with several of our Centre for Research Collections colleagues! ‘Masterpieces II’ opens in early April in Edinburgh University Main Library Exhibition Room, 30 George Square. Entry is free. Watch this space, and our Facebook page and tweets, for further details. This week we have accessioned into the Archive a digital copy of a black and white, silent film of Leith Hospital Flag Day, 1938. The original film was deposited with the Scottish Screen Archive by Edinburgh Cine & Video Society (ECVS), the creators, for long term preservation. The film was inaccessible in its original state but LHSA has arranged for the film to be digitised with copies for ECVS & LHSA, and as a result, ECVS has granted the Archive permission to use the film on our website and for other educational purposes. This is a good example of collaborative working between organisations for the benefit of all. 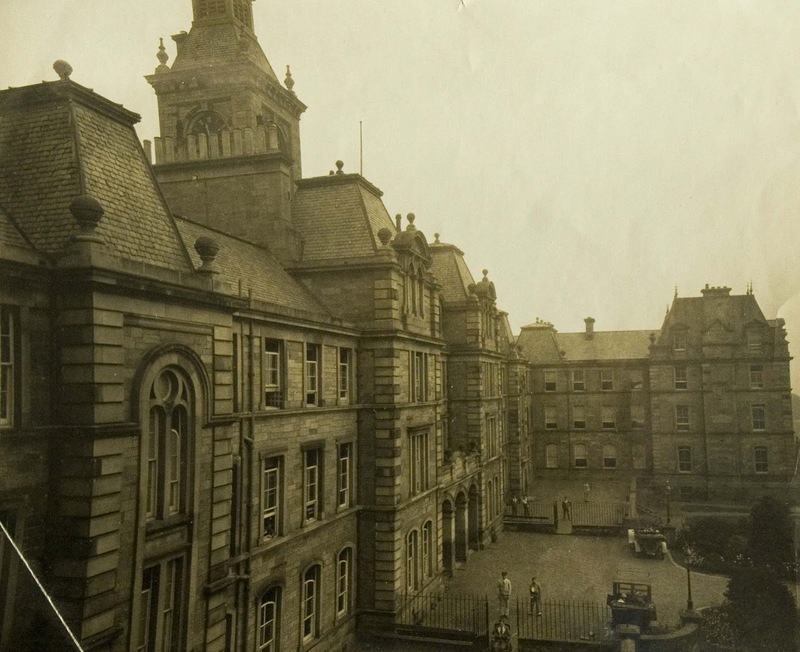 Leith Hospital’s pageants, or Flag Days, were big events in the community and played an important part in fundraising for the Hospital in the days before the NHS. The annual report for 1938 (ref: LHB6/2/70) tells us that £1,621, 15 shillings and 2 pence was raised at that year’s event. The film is less than 2 minutes long and shows people enjoying themselves at parades with floats, marching bands and Penny Farthing Bicycles! We look forward to making it available soon on our website: http://www.lhsa.lib.ed.ac.uk/. The Western General Hospital on Crewe Road South, Edinburgh, has its origins in a poorhouse established in the parish of St Cuthbert’s in 1761. In 1863 the City’s Medical Officer, Henry Littlejohn, ordered improvements to be made in response to insanitary conditions, and in 1868 the Craigleith Hospital and Poorhouse opened. This served the needs of the parish’s paupers until 1914 when it was taken over by the Army. During the First World War Craigleith was used as a hospital for military casualties. An edition of the ‘Craigleith Chronicle’ from this period has been digitised and can be read online, please click here. In 1929 the Local Government (Scotland) Act was passed, which empowered local authorities to upgrade the former poorlaw hospitals like the Craigleith and make them available to the general public. Upon improvement to a municipal hospital, Craigleith changed its name to the Western General Hospital. During the Second World War many members of the Polish army found their way to Britain. Among them were some medical specialists from Polish medical schools, and a number of medical students. On 24 February 1941 the President of the Polish Republic, then in exile in London, issued a decree officially instituting the Polish School of Medicine at Edinburgh, and on the same day Edinburgh University signed an agreement with the exiled Polish government. Part of the Western General, with 120 beds, was set apart as the Polish, or "Paderewski", Hospital. The last students from it graduated in 1949. The Hospital passed to the NHS in 1948, and it is known today for specialist clinical units as well as more general treatment. It is currently home to regional centres for cancer and clinical neuroscience, the Regional Infectious Diseases Unit and the Minor Injuries Clinic. Lothian Health Services Archive holds a wide range of material relating to the administrative and clinical history of the Western General dating from 1930 to 2010, including the ‘Paderewski time capsule’, an exciting discovery made during building works to the Hospital site in 2010. For more information please see the online catalogue or contact us on lhsa@ed.ac.uk.